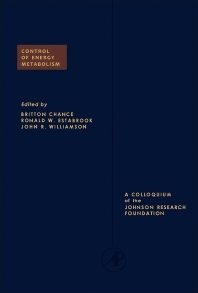 Control of Energy Metabolism: A Colloquium of the Johnson Research Foundation focuses on the processes, reactions, and approaches involved in the control of energy metabolism. The selection first offers information on the respiratory chain as a model for metabolic control in multi-enzyme systems, dynamics and control in cellular reactions, and computer-based analysis of biochemical data. The text then explores purification and properties of rabbit skeletal muscle phosphofructokinase; multiple forms of heart phosphofructokinase; and mechanisms of inhibition and activation of phosphofructokinase in Novikoff ascites tumor cells. Discussions focus on the properties of purified phosphofructokinase; effect of heart extracts on reactivation of phosphofructokinase; active and inactive forms of phosphofructokinase; and effect of hexose phosphate and adenylic nucleotides on reactivation of phosphofructokinase. The manuscript takes a look at enzyme and metabolite profiles; coordinated stimulation of hexokinase and phosphofructokinase by phosphate in a reconstituted system of glycolysis; control of hexokinase in ascites tumor glycolysis; and cation flux across the mitochondrial membrane as a possible pacemaker of tissue metabolism. The selection is a vital reference for biochemists and researchers interested in the control of energy metabolism.